For a more relaxed, intimate setting, the Woodard Cane Lounge Chair Patio Set gives you two lounge chairs and an end table with glass top. The high quality extruded aluminum frame gives you a rattan look without the maintenance. The cushions are totally customizable so you can choose from several outdoor-grade fabrics on the reticulated foam cushions. 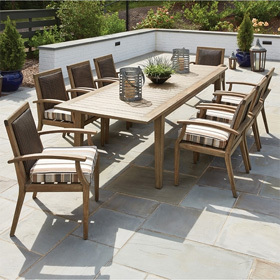 Durable and ready for extreme weather and climate, your Cane Patio Set by Woodard will be sure to last for years to come, offering you a look and style that will have you heading for your patio again and again. Your choice of outdoor fabrics for the cushions. Lounge Chair 28"W x 32"D x 31.5"H 35 lbs. End Table 16"L x 16"W x 22"H 10 lbs.